Omega’s new DPF20 Series of indicators offer real flexibility for measurement of a wide range of frequency or pulse inputs. 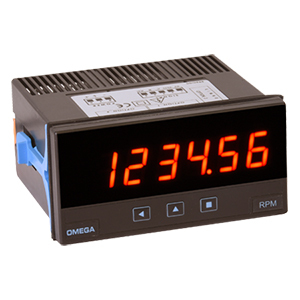 The display is easily configured to indicate frequency, rate, period or count. This makes the meter ideal for flow applications where they can display flow rate or total from a variety of different flow sensors. Or for quadrature signals, to indicate angular position or rotational speed and direction. The DPF20 series offers exceptional performance at an economical price, with some unique and powerful features. Allows for a delay in the start-up time after powering the instrument. During this time the instrument performs no measurement or control. Ability to reset the display count on instrument start-up. Select from 5 levels of LED intensity. Password protect the configuration menu. This blocks access to the instrument set-up parameters, but the operator can still access set-point values. The fast and simple way to configure a sensor. Select from a predefined list Eg. NPN, PNP, Namur, pick-up, inductive, etc. Simple selection of the optimal trigger level for the sensor input. The display indicates up or down reflecting the status of the input signal level. When the LED changes state continuously the optimal trigger level has been achieved. Note: To order with optional green display add suffix “-GN” to meter model number. Contact sales for pricing. Additional 2 weeks delivery. To order with plain front lens (no operator access to buttons) add suffix “-NBT” to meter model number. Contact sales for pricing. Comes with unit of measurement stickers, panel mounting clips, and installation/operator’s manual.